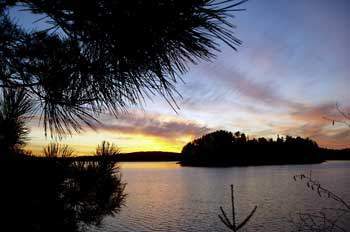 Quetico Provincial Park has a vast expanse of lakes, rivers and forests for you to explore in one of the greats symbols of Canadian History, the Canoe. With over 80 kilometres of portages, 2975 lakes and 4, square kilometres of land, your adventures are endless. There are six entry stations located around the Park. You can access Dawson Trail, Atikokan, Beaverhouse and Lac La Croix by car or fly into Cache Bay or Prairie Portage. There are is roughly 2200 campsites in the interior and being a wilderness park there is a ban on mechanized travel, cans and bottles. These are not permitted in the interior of the park. You can stop in to Atikokan before or after your trip, there are all the amenities you need. There are a number of Americana and Canadian Outfitters willing to assist with your trip planning and will supply you with all the appropriate gear required. You can visit the Dawson Trail Campground and talk to the Natural Heritage Education Leader or Gate staff about your trip plans; they can assist in finding features you may wish to visit on your trip.